Guentzel’s first full NHL season was a strong one as he finished sixth on the team in scoring while showing he could play well in a top-six role. That type of success has him poised to land a considerable raise on his next contract. 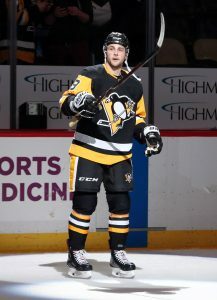 His situation somewhat mirrors that of Conor Sheary, who also largely came out of nowhere to show some chemistry with Sidney Crosby and be productive. He landed $3MM per year on his second deal and that’s going to represent the floor for a new contract for Guentzel. Pittsburgh paid a notable price to bring in Brassard late last season and the move didn’t exactly pay immediate dividends. While he certainly gives them even more enviable depth down the middle, they’ve kicked around the idea of making him a top-six winger as well. At either rate, Brassard should be able to command something slightly above the $5MM he’s currently making when he hits free agency which is going to probably make him too pricey to keep around. Even if he plays at the wing next season, there will be plenty of teams that view him as a center and with the demand for that position only getting stronger, he will have plenty of suitors on the open market. Hagelin’s addition (one that cost them David Perron and Adam Clendening) is one that the Penguins would probably like back in hindsight. His speed is a real weapon but he has produced more like a third liner than a top-six forward. Given how tight they are to the cap, they can’t have too many inefficiencies like that on their books. Unless he’s willing to take a big pay cut, he likely won’t be back. Sheahan fit in nicely after being acquired early on from Detroit. He’ll slot in as the fourth line center (unless Brassard moves to the wing) which will limit his potential for a raise on his next contract. DeSmith will hold down the fort as the backup while allowing Tristan Jarry to take advantage of his waiver exemption and play a starting role in the minors and then will likely cede his spot to Jarry for 2019-20. As for the other four, none project to have a particularly notable role for the upcoming season and are basically just cheap roster fillers. They’ll either be retained around that rate for next year or be replaced by someone else that’s willing to play for the league minimum (which moves to $700K in 2019-20). Murray’s first full season as the undisputed starter for Pittsburgh didn’t quite go as well as anticipated. He struggled to stay healthy and wasn’t quite as effective as he was the year before. If that continues, his next contract wouldn’t be for much more than his current one. However, if he establishes himself as a high-end number one starter within the next two years, he could double his current deal (and potentially then some). Needless to say, he’ll have a lot on the line over the next 24 months. Schultz wasn’t able to come close to repeating his performance from the year before, the one that earned him his current contract. They’ll be counting on him to rebound next season and if that doesn’t happen, he’ll start to be involved in trade speculation before too long. Simon and Sprong are both youngsters that will be looking to establish themselves as full-time NHL players. Assuming that happens over the next two seasons, they should be in line for a decent raise; Sprong has the higher-end earning potential if he can lock down a top-six spot over that stretch. Oleksiak fit in nicely after being acquired in a midseason deal from Dallas. He’ll slot in on their third pairing and while that cap hit may be a little high for someone that’s likely to be a number six defender, they’ll certainly be pleased with having a bit more stability in that role after rotating a few different players through that spot in recent years. It’s safe to say that Pittsburgh’s core is unlikely to undergo much in the way of changes anytime soon with this many long-term deals on the books. Crosby’s deal is one of the back-diving deals that is now outlawed in the CBA. He has provided considerable value on it already and should continue to do so for a few more years at least. Worth noting is that the final three years of his deal see his salary drop to $3MM per year. Malkin is the highest-paid second line center in the league but considering he’d be a number one on many teams, it’s not really an overpayment. For all of the flak Kessel receives about his all-around game, he’s still one of the more prolific offensive wingers in the game and as salaries continue to rise, the portion of Kessel’s deal that Pittsburgh is paying equates to pretty good value. Hornqvist signed his deal partway through last season and while he probably left some money on the table in terms of an AAV, he managed to secure an impressive five-year term. Given his style of play, the Penguins will reap the benefits now but the last year or two is going to carry considerable risk. The team clearly believes the best is yet to come from Rust who has yet to surpass 15 goals in a single season but he has fared well in a top-six role. Even so, he could be a candidate to be moved for salary cap purposes down the road, much like Sheary was earlier this offseason. On the back end, Letang, when healthy, gives the Penguins a legitimate top pairing player. However, staying in the lineup has been a question over the past several years (although he suited up 79 times last season, his most since 2010-11). His defensive game is a concern but he is still one of the better offensive threats on the back end. Maatta hasn’t really blossomed into the top defender the team was envisioning but he still fills an important role and at the age of 24, they’re certainly hopeful that there is room for improvement. If not, a mid-tier defender at this price point still isn’t a bad deal. Dumoulin isn’t going to produce much but he has become a heavily relied upon shutdown player in recent years and plays a key role for them at a pretty good price point. Johnson’s deal has been widely debated already – although the cap hit isn’t terrible for a player not far removed from being a true top-four defender, they’re running a fair bit of risk with a five-year term. Like Hornqvist, this deal could be a tough one in the final year or two. The Penguins once again head into the upcoming season with minimal salary cap flexibility. With more than $52MM locked up in nine players through 2021-22, that projects to be the case for the foreseeable future as well. However, GM Jim Rutherford has been adept at finding ways to free up extra space before so if the opportunity presents itself to make an in-season move to improve the team, there’s a good chance he’ll find a way to make it happen. You do realize that the Penguins don’t win either Stanley Cup without Carl Hagelin, right? That he changed the entire culture of their team? They moved to the speed game away from the “heavy” game that the Kings made popular a few years ago. That every team in the league has been chasing speed ever since? That the main consideration given to every single draft pick, trade acquisition and free agent by every single team in the NHL since the 2016 Cup has been their speed? I could argue that the Hagelin trade literally changed the NHL. The Pens would do that deal again a million times out of a million. I stopped reading the article once I got to that sentence. No Hagelin = No HBK line which was integral to the first Cup. He played a huge role on the second one, too. What an awful article. While I agree with most of what you said, the Hagelin deal didn’t change the NHL. The Penguins didn’t just “discover” speed and it’s been the “thing” ever since. In 2015, every team in the league (including the Pens…signing Comeau and Downey and bring in Spaling) was trying to get “heavy” after the Kings second Cup. The shift in drafting and team building philosophy after 2016 towards speed forsaking size is as quick a 180 as any in NHL history.